Someone once said that the best ideas are often simply looking at old ideas in a new way - in a new light. That's exactly what artist Paul Wainwright has done in his latest series, a beautiful photographic experiment using pendulums. Also known as a harmonograph, Wainwright took the cavernous space of his empty New England barn and converted it into a giant harmonograph. Originally developed in the 1840s as a type of drawing machine, the harmonograph was initially configured with a small bag of sand or other fine material attached to a long rope or string. A hole was cut in the bag, and the bag was set swinging. As the pendulum moved through its stately and often unexpected arcs, a beautiful series of line drawings emerged, carving out the path of the pendulum onto the paper. The more complicated harmonographs incorporated two or more strings, so that competing pulls in various directions would set the bag swinging in more complicated patterns. Wainwright has taken that concept one step further, attaching a light source to the end of his pendulum in place of a bag of sand, and taken long exposure photographs of the resulting patterns. 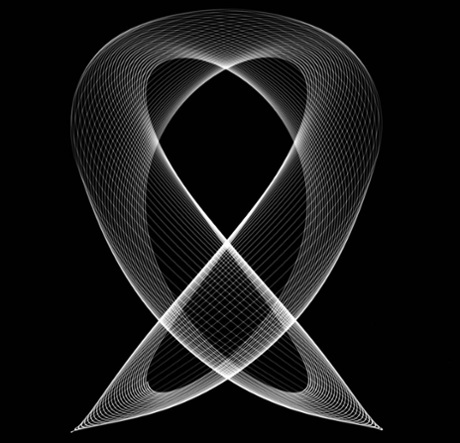 Known (apparently only to mathematicians) as Lassajous figures, though the more popular name harmonograph is generally the term used by the public. Wainwright's camera points directly upward from beneath the pendulum, making the focal plane of the camera analogous to the sheet of paper in the original device from the 19th century. Most reviewers interested in his pendulum project only casually note that he is also an accomplished large format black and white photogapher, and attempt to describe his pendulum project as a hobby- but that strikes this writer as a fairly naive interpretation of what an artist actually does. All our projects are hobbies, with the possible exception of commissioned works, and yet at the same time none of them are. Any hobby that involves passionate creation should be considered artwork, whether it involves traditional perceptions of what 'art' is or not.